These are our smaller rooms and all have one thing in common. 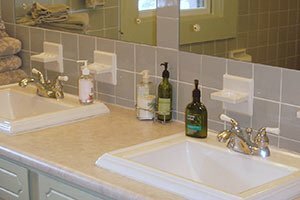 When adjacent rooms of our Island Bed and Breakfast are booked, guests will have to share four different bathrooms. Bedroom with two twin-size beds. 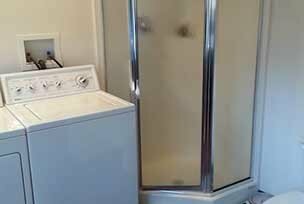 Bathroom with shower, double sink, utility room with washer/dryer. 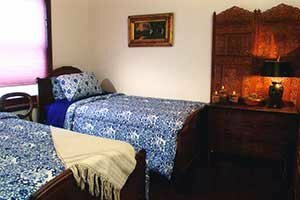 Kayla’s room shares an area with Sheila’s room and is secluded from the rest of the activities at Insel Haus. The décor of those two rooms is very similar. 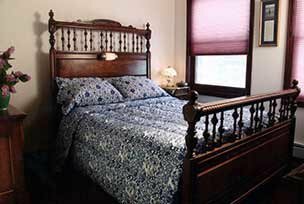 Kayla’s room features two antique twin beds, chair and antique dresser and nightstand, is our least expensive room and could have to share the bathroom with Sheila’s room. Bedroom with one queen-size bed. Sheila’s room has the view of the Straits of Mackinac and in the summertime the view of a butterfly garden right outside the window. 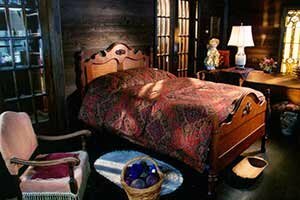 The room features the same décor as Kayla’s room but has an antique full-size bed with a large wooden headboard and the matching antique dresser with a beveled glass mirror. Nightstands, side tables and chairs covered in German mohair fabric finish the décor. 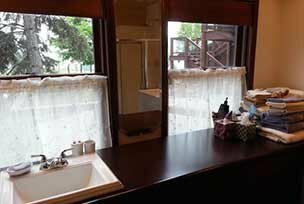 Opa's Room can be rented with private bathroom. 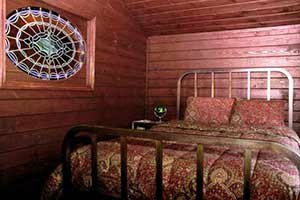 Opa’s Room also has the view of the Straits of Mackinac and in the summertime the view of a butterfly garden right outside the window. 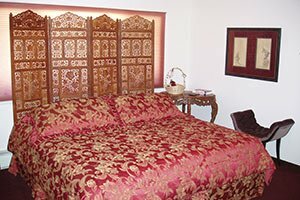 It is the only room with a king-size bed and for an additional charge can be rented with access to a private bathroom. A desk, two bookcases filled with an eclectic library and a large Lazy Boy chair, in-room TV and of course access to Wi-Fi round out this oasis. Bedroom with one full size and 1 twin-size bed. French doors lead to a sunken veranda. You will feel as if you are in a ships cabin. All the walls are dark cider siding. Large windowsills flank Cabinets with “Fleur de lie” beveled glass doors. 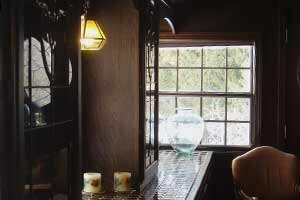 Those cabinets are filled with a collection of antique glass. The Honey window, a large stained glass window bathes the room in an amber light. A sitting area with hundreds of books leads back into the rest of Insel Haus. And, yes there is an antique bed, chairs and rugs. For your comfort terrycloth bathrobes are part of this room. 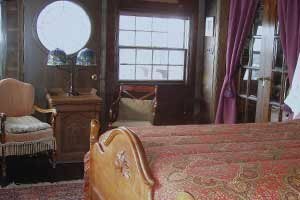 Here, you can enjoy a splendid view of the Straits of Mackinac while lying in bed. Our guests find this a truly unusual observation post. Bedroom with one full-size bed. 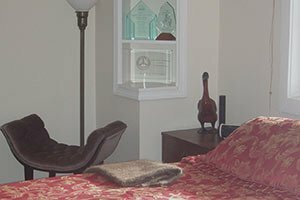 Moe’s Room is one of our smaller rooms with a great view of the Straits of Mackinac. It is one of the original two small dormers that gives Insel Haus an interesting roofline. The Sunsets from this perch are fantastic. The room features a full-size bed, a nightstand, desk and chair. A sitting area, called the studio is being shared with the Bunk Bedroom. The same goes for the bathroom located between the two rooms. 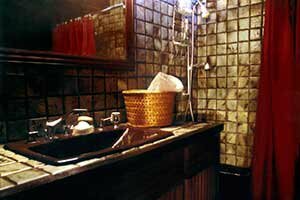 The bathroom has a bathtub, toilet, sink and an antique chest of drawers. Bedroom with two bunk beds and one twin-size bed. 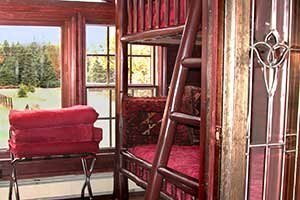 The Bunk Bedroom is a room you cannot get kids to leave. Everyone wants the upper bunk. I do not know why. I am ready to have the guests stay for free in this room if they make up the upper bunk before they leave!! The room has a very special history. I had a local island resident design and fabricate the beds so they look as if they just grew out of the floor right into the ceiling. And then I asked him to stain the wood in my favorite color - mahogany. It pained him since he normally finishes everything in the color of the natural wood. A great view of the meadow and the forest finish this room. Again, a sitting area called the studio is being shared with Moe’s Room. The same goes for the bathroom located between the two rooms. The bathroom has a bathtub, toilet, sink and an antique chest of drawers.